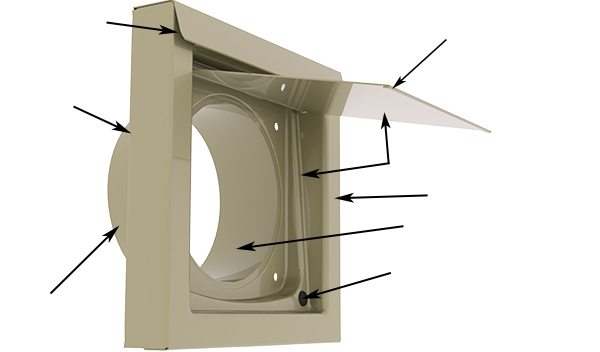 The Dryer Wall Vent's "no"-profile frame, recessed damper and hidden fasteners keep exterior lines simple and clean. Available in three powder coating colors, the finish compliments every home's beauty. Tough-as-nails construction ensures a very long duty life. The body is constructed of 26 gauge galvanized steel. Combined with dense powder coating, Dryer Wall Vents are corrosion resistant and impervious to sun and heat effects (unlike plastic vents). A 1/16" smaller port slips, quickly, inside the in-wall duct (no worries about obstructions for existing construction). A caulk bead will usually be enough to finish the job, but there are hidden fastener holes for drilling four screws fast. Zero airflow restriction is achieved with a large clean opening and lighter damper (30 Ga.). Balanced magnets help prevent pest intrusion. Rubber damper bumpers can help for a quieter closing. The Dryer Wall Vent is the last vent closure a home will need. It's durable construction helps stand the test of time. Available in three colors, high quality powder coating helps every vent blend in nicely with the exterior, enhancing the home's beauty. The lighter damper (30 Ga.) contributes to airflow efficiency, and is set inside the face of the vent for aesthetics and intrusion protection. Small, low-strength magnets create an additional obstacle for pests and help minimize opening / closing due to high winds or negative pressure. Special rubber bumpers assist in noise reduction when the vent closes and allows the magnets to pull the damper inside the housing. When you're in the business of building beautiful homes, select the Dryer Wall Vent as a premium component that makes a positive contribution to exterior aesthetics. My home's original dryer vent had been chewed to pieces by my new dog. This unit is well made, easy to install, and is flush against the house…dog-proof! I am very pleased with it. Easily the best, most attractive and most durable unit on the market. This item is heavy duty, low profile and blends in nicely with my house. The vent is visible from the road, so I wanted something which looks good. I highly recommend it. Great product, quick install, and looks good. Super value.